In these tempestuous times, stories are my lantern in the storm. They’re my balm, my trial, my open hand, and my raised fist. Recently my community endured rising Texas floods, howling winds, and political feuds. Yet fiction forges connection. Allies clasp hands on the page. These stories of survival and magic come from my heart and I hope that they touch yours. 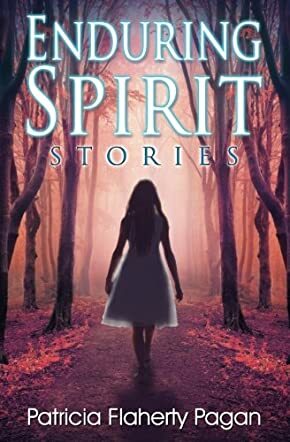 Enduring Spirit: Stories: The Crossroads Collection Book 2 is a collection of short stories written by Patricia Flaherty Pagan. Pagan is an author, poet and creative writing instructor. Maeve’s life was circumscribed by things to be afraid of. Her bruised skin and the haunted look in her eyes spoke volumes about the impact grownups had had upon her life. She was also all too aware of the many superstitions regarding stepping on cracks, playing with a Ouija board or eating grasshopper pie, among other things. The supposedly haunted playground, though, held no such fears for her; nothing, that is, compared to her fears of him. Boys didn’t frighten her, nor did the ram-horned puca who came to visit her in that forgotten place where children once played. At first, she thought he had been a figment of her imagination fueled by the boys’ fantastic stories, but, somehow, improbably, a most unusual friendship was struck up between the sad little girl and a giant magical rabbit. Patricia Flaherty Pagan’s short story collection, Enduring Spirit: Stories: The Crossroads Collection Book 2, immerses the reader in a magical world where giant rabbits rescue real life damsels in distress, and a college student is witness to the brutal and covered-up slaying of a man who was larger than life. Pagan’s writing is translucent and glowing. Each story wraps the reader up in a mystical cocoon where they are willingly enthralled and held captive until the last words reel off the page. I was not familiar with the author before I came upon this volume, and I’m so glad I finally did make her acquaintance. Each story is evocative and powerful, and the author’s writing style is seductively smooth, crystalline and endlessly enchanting. Enduring Spirit: Stories: The Crossroads Collection Book 2 is most highly recommended.